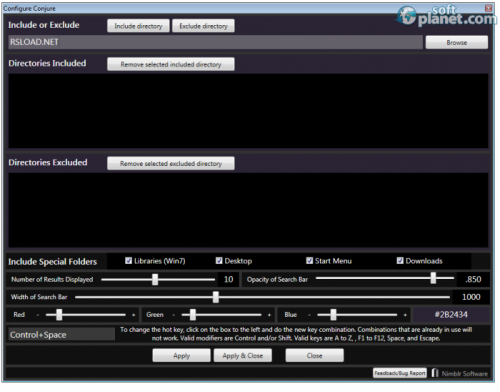 SoftPlanet makes it possible for everyone to get free Conjure download directly from our servers. There is no registration needed for downloading. Conjure 0.72 Beta is a fast and lightweight search alternative for Windows 7 an Windows 8. It allows you to find a particular item on your PC. Conjure is also flexible and customizable. Recently a company named Nimblr Software announced that it had developed a search alternative for 64-bit versions of Windows, titled Conjure. It is sad that it is not available for 32-bit operating systems, but maybe it is a matter of time before Nimblr changes this fact. Conjure is a small application, which allows you to quickly and easily search your PC. You can adjust the level of access by including and excluding some of the folders. The interface is pretty simple, but in the meantime very classy in my opinion. You can perform some changes to the design like setting a specific color, determining the number of results, width and opacity of the search bar. Once you enter a keyword, a list of results will open in front of you. It is very perspicuous. The results contain the name, the path and the extension of the file. It is very helpful that you can set a hot key in order to access Conjure faster and easier. Conjure is a perfect solution, if you've got tired of the standard and sluggish search function of Windows 7. Before actually downloading and installing it, you should check your OS version. Make sure it is 64-bit, otherwise it cannot be installed. Our security scan shows that Conjure is clean from viruses. The current version of Conjure has been scanned by our system, which contains 46 different anti-virus algorithms. That ensures that Conjure 0.72 Beta is 100% safe for your computer.